Dichotomous is not a word one finds on the usual breakfast food box. It means two-pronged, and a dichotomous plant key provides a systematic way of identifying plant species. Such a key works for rhododendron species. It also works for wildflowers, and in fact most of us will have much more opportunity to use it for wildflowers than for rhododendrons. Keying out plants is a lot of fun too, especially once one has enough familiarity with the system that it is not necessary to look up the meaning of every single botanical term. The purpose of this article is to show how such a plant key works, mention some of the pitfalls, and describe what is needed to get started. In principle, a dichotomous key is laid out like a tree with many two pronged forks. We start at the base, and work up to the first fork, where a choice is made as to which way to go, based on some characteristics of the plant. We then move to the next fork, and make another choice, etc., until eventually we reach the end of a branch, which, if everything works correctly, should be the plant we are trying to identify. 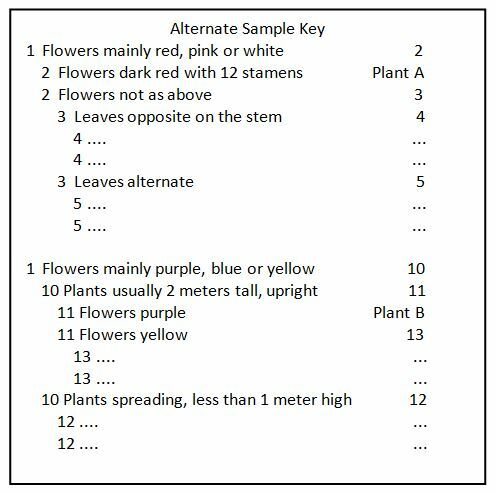 To see how this works, consider the much simplified (and totally artificial) example, shown to the right, of a fragment of such a key and suppose that we have a tall plant with dark red flowers and 12 stamens to identify. We start with choice 1, and are led to 2 instead of 10, because the flowers are red. Choice 2 gives a choice between dark red flowers with 12 stamens and other. So Plant A is the answer. Rarely is it this simple, but we see the principle. Now suppose we have a tall plant with purple flowers. Again starting with 1 we now choose 10 because the flowers are purple. 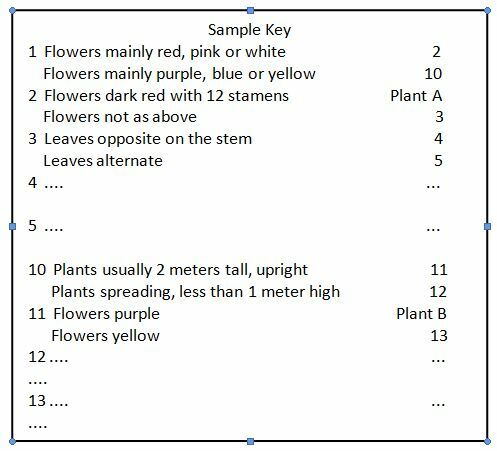 At 10 we choose 11 since the plant is upright and then at 11 we choose Plant B since the flowers are purple. Clearly either of these layouts work, as they both give a series of two choices. The first has the advantage that the two choices are always together, but then one jumps all around for the next set of choices. The second method can have the two choices separated by pages, especially early in the key. But one stays within a contiguous section of the key, which gets smaller and smaller as one progresses. Once a result has been obtained, it is important to read the description of the plant carefully to see that all of its characteristics match, as often there will be distinctive features that didn't happen to be needed in the key. If there is an important mismatch, it probably means an error has been made. We can see from the way such keys are constructed that every plant in the key must be described by a unique chain of characteristics. Thus if there are lots of plants, say because the key covers a huge area, the key can get very lengthy and complicated. On the other hand if we have a plant that is not included in the key we may follow through the key and come out with a result which doesn't correspond at all to the plant, based on the full description. Thus the best keys are those that are as complete as possible but cover a restricted geographical area. Then you don't waste time eliminating choices that only occur far away from your location and you can be reasonably sure that you should be able to find the plant you have in the key. Like in any endeavor, there are good and bad practitioners, and there are good and bad keys. The keys are written by professional botanists, often ones working primarily from herbarium specimens. That introduces some limitations. For example suppose the choice is a) leaves 2-4 cm x 5-9 cm versus b) leaves 3-5 cm x 7-11 cm and you have a plant with leaves mostly 3 cm x 8 cm. What this choice means is that the botanist who wrote the key measured a lot of herbarium specimens and found that on average the leaves of choice a) were smaller than choice b). But choices a) and b) overlap. In a perfect key one shouldn't have such situations. But with only one plant in hand what do you do? Basically you have to follow both branches. Usually for one branch or the other you will eventually come to a branch where both choices are clearly incorrect, which tells you which branch you should have chosen originally. Another situation which arises as a consequence of developing keys from herbarium specimens is more amusing than disastrous. Suppose you want to separate two plants. One, Plant A, is 2 meters tall, upright with red flowers. The other, Plant B, is low and spreading with purple flowers. In the key you may find the choice which is to separate these two plants to be something like: hairs on the ovary are gland tipped or not gland tipped. This may be a perfectly valid distinction, and one visible in dried herbarium specimens. Herbarium specimens do not preserve colors very well and things like height and aspect of the plant can be determined only from the collector's notes, which may not be complete. Hence characteristics which are obvious when the plant is in hand may not be obvious in herbarium specimens. One needs a key of course for the plants and geographical area of interest. A small 10 power magnifying glass is essential. Tweezers and a metric ruler are useful too. A good glossary of botanical terms is very helpful, though it doesn't take long to learn most of the common terms. Such glossaries can be found online, or one can just look up terms online as needed. Start by looking at the parts of a flower and the names for leaf shapes, and for rhododendrons some of the different kinds of hairs and scales which appear. Most everything else will come with a little practice. Most of all though one needs an inquiring mind, a mind that likes to look at the details of plants, which are often just as beautiful and interesting as the more flashy aspects of the plant. One also needs to like the intellectual challenge of solving a puzzle, and being able at the end to say "I know and can name that plant." The classic keys are in the Notes from the Royal Botanic Garden Edinburgh, Vol. 39 No 1 by J.Cullen and Vol. 39 No 2 by David Chamberlain. These lay out the Cullen and Chamberlain revision of rhododendrons, which lumped a number of species together, but which is more or less accepted now. The main disadvantage of these is that they are 35 years old and out of print, and probably hard to find. A somewhat abbreviated version of these keys appears in Hardy Rhododendron Species by James Cullen, Timber Press, 2005. This reference has detailed discussion with illustrations of the different types of scales and hairs relevant to rhododendron identification. For the many newly discovered species, Flora of China Vol. 14, Missouri Botanical Garden Press, 2005 is useful, though it includes only rhododendrons that can be found in China. The most useful keys for azaleas seem to be those in Rhododendron Species Vol. 4 - Azaleas by H. H. Davidian, which contains detailed descriptions and line drawings of most azalea species. Vols. 1-3 of this series are useful also for other rhododendrons, though Davidian was a "splitter" and recognizes many species which now have been lumped together. The classic key for wildflowers of the Pacific Northwest is Flora of the Pacific Northwest by C. Leo Hitchcock and Arthur Cronquist, University of Washington Press, 1973. This is a condensation of a five volume work published from 1955-1969. It covers Washington and parts of Oregon, Idaho, Montana, and British Columbia. It is useful in that it has a lot of small illustrations showing the distinctions between many of the choices. It doesn't have a lot of description of each plant other than what is used in the key however so one often can't check the result of the key by comparing additional features with the plant in hand. Furthermore it covers such a large and varied area that there are many plants which would never appear in any more restricted part of the range. Also there have been many changes in nomenclature and much new information obtained in the 45 years or so since this was written, though apparently a revised and updated version is in preparation. The most useful key for our area of coastal southern BC is Plants of Western Oregon, Washington and BC by Eugene N Kozloff, Timber Press 2005. It seems to be very complete for the region it covers, has good keys, line drawings illustrating some of the distinctions in the choices and some 700 color pictures of the plants. It is also a relatively modern book, incorporating nomenclature changes since Hitchcock and Cronquist. Flora of Mount Rainier National Park by David Bick, Oregon State University Press, 2000 is very good for its restricted region, with good keys and descriptions and information on locations within the park where the plants can be found. Further afield, Flora of Alberta by E.H. Moss, 2nd ed. by John G. Packer, University of Toronto Press, 1983 is good for Alberta and specifically the mountain parks, Banff and Jasper.